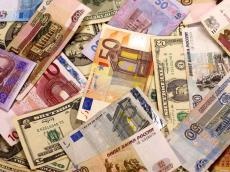 Official exchange rate of the Azerbaijani manat against the US dollar, set by the Central Bank of Azerbaijan (CBA), remained unchanged last week. Accordingly, at the end of the week, the average rate was 1.7 AZN/USD. At the end of last week, the official exchange rate of manat against euro, set by the CBA, increased by 0.0145 manats or 0.74 percent. Accordingly, the average AZN/EUR rate was 1.9624 manats. The official exchange rate of manat to Russian ruble, set by the CBA, increased by 0.0005 manats or 1.96 percent. Accordingly, the average AZN/RUB rate was 0.02586 manats. The official exchange rate of manat to Turkish lira, set by the CBA, increased by 0.0064 manats or 2.3 percent. Accordingly, the average AZN/TRY rate was 0.28114 manats.